There are lots of mapping applications on the web but Platial offers something a little different. It is a social networking site where people blog about their interests and favourite places, but in this case they place it on a map. 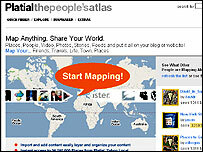 This site bills itself as the people's atlas. You do not have to register if you want to check out other people's maps and see what they have said about a place. There are good tips for travelling with kids or if you want to find a night club that is popular with locals rather than tourists. However, you have to register if you would like to add your map and places of interest. Registration is quick and easy and you do not have to type out a lot of information about yourself. To create a map, click Mapmaker, choose a location and what kind of map you are about to create and off you go. Once you have created the tag you can add pictures from a Flickr account or directly from your PC, add links and information. The site will tell you if somebody else also tagged the same location and if you want, you can join them. Most of us spend a lot of time in front of our e-mails and this application is giving us the opportunity to make them a bit more fun. A bit gimmicky but nevertheless an interesting idea. Downloading the 3D Mailbox application reveals a whole new way to look at your e-mails. There is a free version of the software to download and once it has been setup you will find you have been transported to a virtual Miami Beach, a place where your e-mails are represented as bikini clad avatars. The outbox shows your avatars enjoying a drink, and if there are any e-mails which your spam manager is unsure about you will find them skating around in the hotel's ice ring. The developers are currently working on other locations around the world, which will be available to subscribers soon. Essentially this app is like a real beach holiday: after a few days it can get boring soaking up the rays. This is also processor heavy software so beware if you do not have a high-end PC. And finally, here is a site for any prospective grandmasters out there. 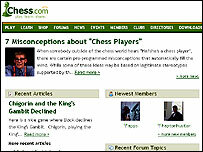 It is a social networking site dedicated to chess lovers around the world. Chess.com only launched in June but already has over 10,000 registered users. It is a fairly niche social networking site, offering its users a platform to share videos, blog and socialise about all things chess related. In order to realise the full potential of the site you will need to create a profile. In the play section you can choose to actually play a game against other users or against the computer. If you are yet to master the intricacies of chess, it is a good idea to explore the learn section, here you will find articles which are updated daily, learn the rules of the game, and even find yourself a coach virtual or otherwise. Click Downloads and you will find third party chess applications, some of these are trial or demo versions, but there are plenty of free full downloads as well.